In the previous article we discussed why network reliability is crucial for UC solutions. This time I will explain why PoE switches are important to grant power continuity of the phone service to match those of traditional PSTN systems. When switching from a legacy phone system to a modern UC server, many things are taken for granted by the buyer. For example, that the system will also work in case of emergency situations, like a power outage. Home analog phones connected directly to a local exchange usually work in the case of power outages, as the local exchange uses a UPS system. Legacy PBXs worked in a similar way, either embedding a battery or relying on a separate UPS system. To allow us to correctly scope the UPS system, a little more information about PoE is required. Once it is decided that PoE switches are a good investment, it is necessary to verify the maximum power that the switch will need to deliver when all devices are connected. If the switch is underpowered, problems like devices/switch rebooting can appear when the power consumption is too high. How do you calculate the power necessary? By checking the number of devices of each class that will be connected, and by multiplying for the maximum power limit of the class, we can obtain the maximum power the PoE switch will withstand. Switch manufacturers call “PoE Budget” the maximum power that the switch can withstand. When selecting a PoE switch, the sum calculated above must be lower than the PoE budget. 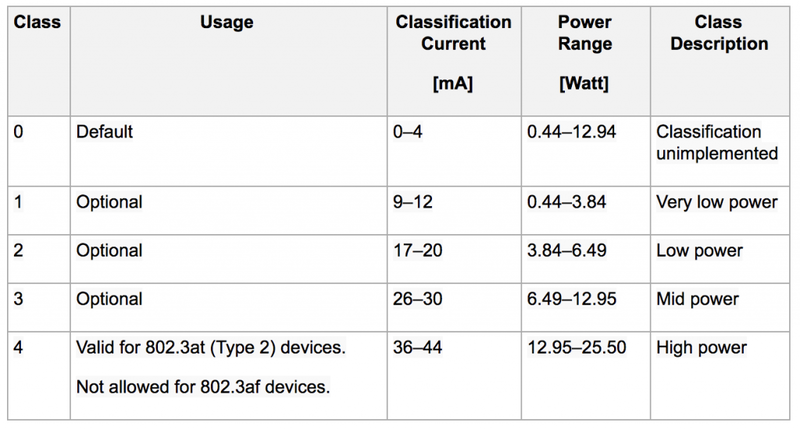 Of course, using PoE devices that consume less power can help in reducing the overall power consumption of the system. Recent standards further reduce the power needed, per port, by implementing a set of savings standardized in IEEE 802.3az. Not long ago, all the network interface controllers in the United States (in computers, switches, and routers) used an estimated 5.3 terawatt-hours of electricity. According to a researcher at the Lawrence Berkeley Laboratory, Energy-Efficient Ethernet can potentially save an estimated $450 million a year in energy costs in the U.S., including savings from both homes ($200 million) and offices ($170 million), with the remaining $80 million being saved by data centers. The power reduction is accomplished in a few ways. In 100 Mbit/s, 1 gigabit, and 10 Gbit/s speed data links, energy is used to keep the physical layer transmitters on all the time. If they could be put into “sleep” mode when no data is being sent, that energy could be saved. When the device’s software decides that no data needs to be sent, it can issue a low-power idle (LPI) request to the Ethernet controller physical layer PHY. The PHY will then send LPI symbols for a specified time onto the link, and then disable its transmitter. Refresh signals are sent periodically to maintain link signaling integrity. When there is data to transmit, a normal IDLE signal is sent for a predetermined period of time. The data link is considered to be always operational, as the receiving circuit remains active even when the transmit path is in sleep mode. Green Ethernet further reduces the power consumption by completely disabling the link if the connected device is turned off. This feature is not applicable to phone devices, of course, as they must always be on. The other improvement introduced by Green Ethernet is to reduce the transmitting power when the cable is shorter. Most devices are connected with a cable much shorter than 100 meters. This entry was posted in Blog @en, Technical Posts on 11 April 2019 by Dimitri Osler.